The S&P 500 rose more than 2 percent last week to post its seventh weekly gain in the last eight. This move has pushed the broad index above its 200-day moving average, a key technical level watched by traders. It has also left the S&P 500 within reach of 2,800, a level the index has not closed above since early November. "It seems a 'panic buying' mood, with purchases by investors who had been lagging the broader market, has strengthened," Nomura says. "It seems a 'panic buying' mood, with purchases by investors who had been lagging the broader market, has strengthened," Masanari Takada, a cross-asset strategist at Nomura, said in a note Monday. "Systematic trend followers that had temporarily suspended buying after the weak US retail sales print have also been compelled to follow the market by adding fresh longs." "We believe as a short-term trading strategy of buying on dips from end-February to beginning-March targeting a subsequent return-reversal is attractive," Takada wrote. This surge comes after a massive sell-off in December that briefly sent the S&P 500 into bear-market territory on an intraday basis. 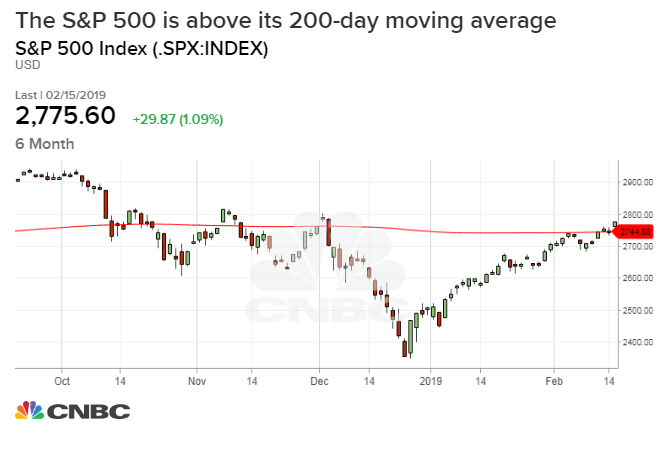 The recent move up propelled the S&P 500 above its 200-day moving average, a technical level closely watched by investors. Usually, when a stock or an index breaks above its 200-day moving average, it signals strong upside momentum moving forward. "At this juncture, the SPX has successfully recaptured the 200-day MA after reversing a downtrend off the October highs," Craig Johnson, chief market technician at PiperJaffray, said in a note. "Further upside from here leaves the 2,800-2,815 range as the next major hurdle for the index to clear." The S&P 500 has not closed above 2,800 since Nov. 8 and is currently 0.9 percent from reaching that level. On Friday, the S&P 500 closed at 2,775.60. "Although the recent price action of S&P 500 has been too volatile to grasp and exact trend, it has returned to the point where these investors are targeting ~2800 again," Nomura's Takada said.